Bring a Triple-Layer Eggnog Pie to your next special occasion. 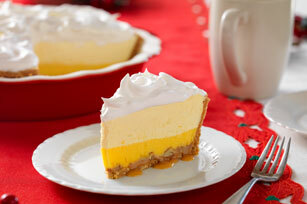 This eggnog pie is composed of layers of caramel, eggnog, pudding and whipped topping. Microwave caramels and 1 Tbsp. milk in microwaveable bowl on MEDIUM (50%) 30 sec. or until caramels are completely melted when stirred. Pour into crust; sprinkle with nuts. Beat pudding mixes, eggnog and remaining milk with whisk 2 min. ; spoon 1-1/2 cups over nuts. Stir half the COOL WHIP into remaining pudding; spread over pudding layer in crust. Top with remaining COOL WHIP. This occasional treat can fit into a healthful eating plan when you balance out your food choices throughout the day. Heat oven to 350°F. Spread nuts into single layer in shallow pan. Bake 5 to 7 min. or until lightly toasted, stirring occasionally. Use 1 pkg. (3.4 oz.) JELL-O SIMPLY GOOD Vanilla Bean Flavor Pudding.